What is going into this area? Fences up. Very hard to see street sign as well as around corner when turning onto Ellis. Trees around area were trimmed but these did not seem to get done. Any way you can have them trimmed back as they are very overgrown. Thanks! these vehicles have been there for at least two years and there was something leaking out of one of them and there is a sink hole created from something tasty to rodents. 4/11/2019, Unable to substantiate complaint by viewing #4's backyard from public ways. Permission needed from abutting property owner(s) to enter onto their property to confirm violation. This basketball court is used quite a bit by kids and adults. I would suggest getting it fixed sooner rather than later. This court is used by many throughout the community, and I agree with the other comments posted here. The court is in dire need of repairs before additional serious injuries occur. 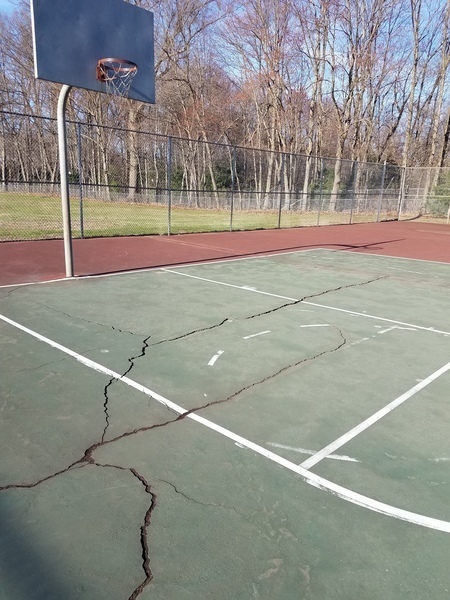 Please fix the tennis courts in Veterans Park while you are at it. Does not appear to be a sinkhole, seems to be from work done by utility company. The area seems to be washing away because vegetation has not been established. We will loom and reseed the area. Area has been reseeded & loomed. There are 5-10 glowsticks on strings hanging on the power lines at the corner of Ernest St and Pierce St. Any way to get them taken down next time someone is in the area? Thank you. The town cannot remove anything in power lines or cable. We will have to reach out the utility company's to see if they will. Thank you. Pole number is 16607 if they need it.